The use of robotic assistance during microsurgical procedures is currently being explored in the treatment of male infertility and patients with chronic testicular pain. Whether the addition of this technology would allow a corresponding improvement in outcomes as when the operating microscope was introduced in microsurgery is yet to be seen. 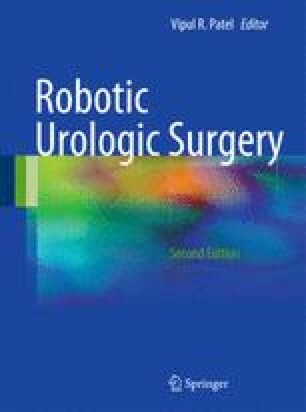 This chapter covers new robotic microsurgical applications such as: vasectomy reversal, varicocelectomy, denervation of the spermatic cord for chronic testicular pain, microsurgical vascular anastomosis, testicular sperm extraction, and nerve graft placement during robotic radical prostatectomy. Preliminary animal studies appear to show an advantage in terms of improved operative efficiency and improved surgical outcomes. Preliminary human clinical studies appear to support these findings. The use of robotic assistance during robotic microsurgical vasovasostomy appears to decrease operative duration and significantly improve early postoperative sperm counts compared to the pure microsurgical technique. As with any new technology, long-term prospective controlled trials are necessary to assess the true cost benefit ratio for robotic-assisted microsurgery. The preliminary findings are promising, but further evaluation is warranted. We would like to thank Dr. Hany Atalah, Katy Lyall, Andrew Hunt, David Regan, Dr. Rachana Suchdev, Intuitive Surgical Inc., and Vascular Technology Inc. for their continued support in the pursuit and refinement of robotic microsurgical techniques and tools.